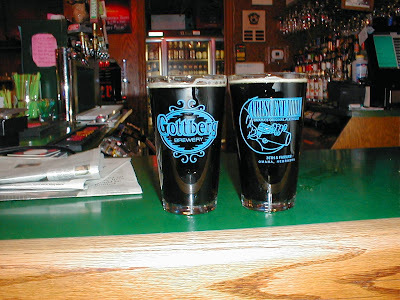 After a hiatus of three years or more, Gottberg beer has returned to Omaha! 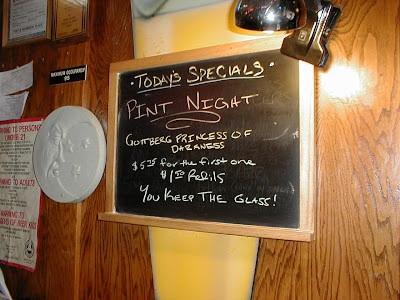 The fine folks at the Crescent Moon Ale House offered our Princess of Darkness Porter at their Pint Night tonight. We made up some special pint glasses, and Paris herself was actually able to attend. They went through a full half-barrel and part of another one tonight, and they expect to go through the remainder of their three kegs tomorrow — Halloween. With luck, we'll end up with a permanent tap at the Moon, along with fellow Nebraska brewers Empyrean and Spilker. First of all, thanks to Bill Rauth for setting me up with a ticket! I was having a beer down in the Huber Haus when Bill said his buddy couldn't make it and asked me if I wanted the ticket. I owe him an equivalent amount of beer when he visits the pub in Columbus! Polka jam at the Huber Haus! Travis Flett(? ), local New Belgium sales guy, introduced the evening's speakers. Eric Salazar has been brewing at New Belgium for 13 years, and his wife Lauren has been doing sensory QA work there for ten. They are both GABF and World Beer Cup judges, and they both really love their jobs! After each of us tasters being presented with our very own New Belgium glass, we started off with Mothership Wit. The name "Mothership" refers to the Fort Collins brewery. This was their first organic beer, and they had a hard time finding their ingredients. Lauren says it pairs up well with shellfish, fish tacos, mussels, ceviche, and Mexican food. Beer #2 was my favorite "everyday" New Belgium beer, 1554. This black Belgian-style beer is fermented with a lager yeast and hopped to 12 BU with Target hops. They don't use any aroma hops. It doesn't fit into any GABF styles; in fact, New Belgium brewmaster Peter Bouckaert (formerly of Rodenbach) says he's not a big fan of beer styles. Rather, he designs beers to answer the question "what are you thirsty for?" Lauren says that she hears a lot of women say that dark beers don't scare them. Pair this beer with cheese, dry-rub barbecue pork and chicken, and burgers. 2° Below, a 6.6% abv Winter Ale, is Travis' favorite. He describes it as "IPA without the bitterness". It has a fiercely spicy floral hop aroma. After a few snacks of crackers and cheese, we were treated to a glass of the famous La Folie. The draft version is a blend of different years' brews. La Folie has its own dedicated set of pipes and vessels in the brewery. It's very tart...more so than the bottled version. It's a great dessert beer, with dark chocolate and nougat. A special treat tonight — well, one of many — was a taste of the special version of La Folie that was brewed for the Falling Rock Tap House in Denver. This one is even more tart and has a much better balance than the standard recipe. The sixth beer was a unique experience: Eric's Ale, also known as "Lips of Faith". It's a wood-aged beer, brewed with peaches and ten-year-old hops, and blended with La Folie and a Belgian Golden ale. 17.5° Plato and 7% abv, for those keeping score. It has a huge peach aroma and a mild peach flavor; it's malty, with a peach finish. If you like Belgian-style fruit beers, this one's for you. Personally, I didn't think the peach worked too well with the Brettanomyces character. Finally, Le Terroir, a dry-hopped sour Brown, and another member of the "Lips of Faith" series. It's fiercely sour. It's really dry. Its Amarillo hop aroma is intense. They made one barrel, filtered it, and carbonated it in the keg, and we're drinking the keg now. (The remnants were still on tap at the Crescent Moon as of last Friday the 26th.) It's definitely the most tart beer of the night...great stuff! Thanks to Eric, Lauren, and Travis for putting on the show, and thanks to Bill and Jen for hosting this party at Max & Joe's! Hmmm...maybe the name "Sam Adams" is more common than they thought. PORTLAND, Ore. - The Boston brewers of Sam Adams beer objected when they learned that a mayoral campaign here included Web sites invoking the name of their product. What they didn't realize is that Sam Adams is also the name of the candidate — and has been since before the beer hit the market. The Portland Sam Adams, a mild-mannered bicycle rider, is a far cry from the Boston Sam Adams, a patriot, brewer, rabble-rouser and business flop of Revolutionary War times. The second cousin to former president John Adams inherited the brewery, and it failed several years later. Read the entire article at Yahoo! News. So I'm enjoying a bottle of Full Sail LTD 02 Limited Edition Lager this evening. The label is a bit vague as to the beer's intended style, so I looked it up on their site. No onions, pickles, severed fingers, nor kryptonite. Hmm. It doesn't even whiten as it cleans. But it's a pretty tasty beer anyway. First, stop thinking of beer as a commodity. It’s not toilet paper, or screws, or an all-you-can-eat buffet. For more details, see pfadvice.com. Last Friday was the NCHS HomeGrown Fundraiser Event, a beer/wine/food fest to raise money for the Nebraska Children’s Home Society Foundation. It was a good time, although we only went through half of the beer we brought. It's clear that when there's wine, they don't drink beer. Ah well. Two different Omaha bar owners said they'd be interested in carrying my beer, so we'll see if they call. Saturday, my customer in Council Bluffs called, saying he had forgot to order root beer, and he needed an "emergency delivery". I told him I'd fill some kegs and deliver them Sunday, since I had to take Paris to the airport anyway. I didn't even scratch the surface of their offerings. I'm planning to go back on Friday, beer list in hand, to do some serious shopping. Monday: PT, and filter the All-American Gold. Tuesday: Brew Tin Lizzie Hefeweizen. Wednesday: PT, and brew Bugeater Brown Ale. Thursday: PT, and clean and fill kegs, then head for Omaha and some beers at the Huber Haus. Friday: More shots in the back, and pick up Paris at the airport. This year's Great American Beer Festival has come and gone, and the medal winners are posted at the Brewers Association site. This is my kind of cruise ship. EX-PAT New Zealanders mourning the World Cup loss have been able to drown their sorrows patriotically after a pub with 75 kegs of a local brew arrived in London on a container ship. The pub was purpose-built in six weeks by Christchurch company 3 Bald Men inside two five-tonne containers and will stay moored at the wharf for two weeks before setting up in a central London site. Read the whole article at news.com.au. Cause and effect: The weather was real nice yesterday, so I opened the windows all over the house, so the cats went nuts because of the fresh air, so they kept me awake last night even more than they usually do, so I didn't even get out of bed until 9:45 this morning, so I didn't brew any Hefeweizen today. I did do a little paperwork, including comparing the cost of our major ingredients from 2004 to the present. Malt prices are up 20-40%, hop prices have doubled (or more), root beer extract is up 21%, and even the stuff I clean the lines with is up 27%. And that doesn't include the increased freight costs due to the near-doubling of fuel prices. Meanwhile, we're still charging the same prices that we were in 1995. And the worst is yet to come. Probrewer.com includes a forum post outlining next year's dire hop situation, and this USA Today article is one of many describing the skyrocketing price of malt. Both malt and hops may double in price again before the end of 2008. Anyway, I also dumped the dregs (spent yeast) from a couple of fermenters. Maybe I'll get that Hefeweizen brewed tomorrow. The Wall Street Journal reports that the second- and third-largest brewers in the United States are planning to merge their U.S. operations by mid-2008. SABMiller PLC and Molson Coors Brewing Co. said they plan to combine their U.S. operations, creating a juggernaut that could threaten the decades-long dominance of Anheuser-Busch Cos. in the American beer industry. The joint venture, to be called MillerCoors, would have annual revenue of about $6.6 billion and yield about $500 million in annual cost savings. The combination would bring together Miller Brewing Co., the second-largest U.S. brewer by sales with about 20% market share and Coors Brewing co., the No. 3 player with about 11% market share. Anheuser-Busch controls nearly half the U.S. beer market. Pete Coors, Vice Chairman of Molson Coors, will serve as Chairman of MillerCoors. Graham Mackay, SABMiller CEO, will serve as Vice Chairman of MillerCoors. Leo Kiely, current CEO of Molson Coors, will be the CEO of the joint venture, and Tom Long, current CEO of Miller, will be appointed President and Chief Commercial Officer. Read the entire press release, which includes brand, strategic, and financial information, at the SABMiller site. Last Thursday morning, I picked up Paris at the Omaha airport. We stopped by Crescent Moon for a quick beer, then headed to Lincoln for lunch at Yia Yia's. That evening was the 14th Annual Okto Beerfest. 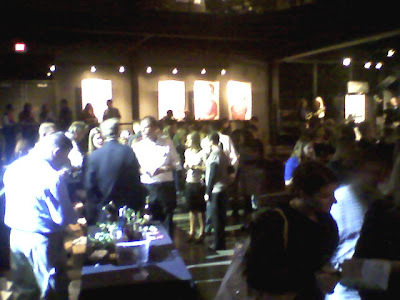 It was hot as hell in the building, but the 800+ people who showed up sure had a good time. We went through a sixth-barrel each of Tin Lizzie Hefeweizen, Bugeater Brown Ale, and Princess of Darkness Porter. Just like last week, we ran out of beer an hour before the end of the show, despite bringing three times as much beer. Friday, I went to physical therapy in the morning and planned to take the rest of the day off, but I got a call saying that the glycol machine was all iced up. So I went over to the brewery, climbed up on the roof, and added 7½ gallons of fresh glycol to the reservoir. The temperature kept going up, so I just shut the damn thing off for the weekend, figuring it would thaw. Today, more physical therapy after cleaning the draft lines. It seems to be working; I don't feel like there's a knife stuck in my back, at least not as often. I spent part of the morning back on the roof with the chiller. It seems to be working now, although the outside of the evaporator is still frosting up a bit. I'll climb back up there tomorrow to take a look. Tomorrow: I should probably brew a batch of Hefeweizen. Friday: Yet another fest, this one in Omaha again. We at Dusters Restaurant and Gottberg Brew Pub want to help breast cancer researchers find a cure for this killer of women by making a donation to the Gateway for Cancer Research. This organization is underwritten by the Cancer Treatment Centers of America, which my mother, Judy Beckstrom, credited with sustaining her during her 15-year battle against the disease. Judy died on October 9, 2002, less than a week before her 58th birthday; the donation will be made in her memory. The total amount of the donation is up to you: I pledge to donate my entire October bonus, which is 9% of the sales of our craft-brewed beers and sodas. The more of our products you enjoy, the bigger our contribution will be. Drink our beer. Drink our pop. Find a cure. Here's an excellent resource from the Beer Judge Certification Program's Continuing Education Program. It's an online dictionary containing (as of today) 249 brewing and beer-tasting terms, from acetaldehyde to yellow. Definitions, etymologies, and pronunciations are included, as well as information on the term's relevance to the brewing process and beer styles. Eventually, I'd like to figure out how to link words on my site to their definitions, but until then, bookmark and use the BJCP CEP Vocabulary Guide. Heading for the Great American Beer Festival next week? The Brewing Network is planning some pre-Fest podcasts, the GABF 2007 Preview (available now), and the GABF Virtual Tour ("coming in October"). During the Festival, they'll carry a Walking Tour Podcast, and they're planning to carry the Awards Ceremony live. I won't be there, but I'll be listening in! Last Thursday was the First Annual Micro Brew Ha Ha, sponsored by Habitat for Humanity of Omaha. It was held outdoors, on the patio of Rick's Café Boatyard, overlooking the river, on a magnificent evening. They were expecting 500 people to turn up, but I'm sure there were more than that. I actually ran out of beer an hour before closing time! Besides Gottberg, the eastern Nebraska breweries were well-represented by Empyrean, Granite City, Spilker, Upstream, and Jobber's Canyon. A couple of wholesalers were there pouring Boulevard, Left Hand and Big Sky beers as well. Remnants of the Aksarben crew. Behold my remarkably elegant table decorating skills! I spent the night in a hotel in Council Bluffs, then picked up Paris at the airport in the morning. We had lunch at an unremarkable Thai restaurant, then headed over to Crescent Moon to get warmed up for their Oktoberfest, which started at 4:00. If you weren't there, you missed a fantastic party! Great German beers, great German food, great German music, and lots of fun people. Monday: Clean the lines, go to physical therapy, do the monthly taxes, move seven barrels of root beer into the cellar, and make 14 more barrels of root beer. Tuesday: make 14 more barrels of root beer. Wednesday: Physical therapy, clean and fill kegs, move seven barrels of root beer into the cellar. Thursday: Pick up Paris at the Omaha airport, then head to Lincoln for the 14th Annual Okto Beer Fest. Friday: More physical therapy...the rest of the day is pretty much open.